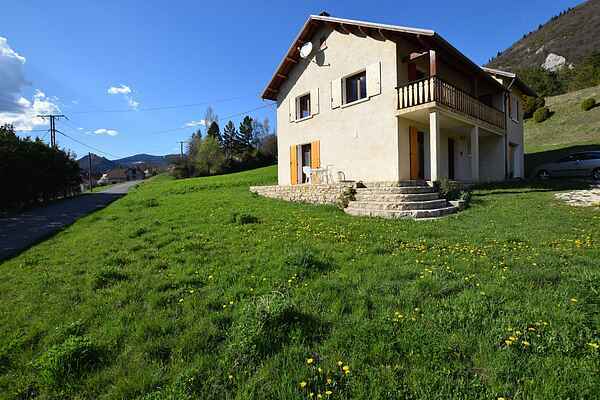 This gorgeous chalet is surrounded by the ten highest mountains in the Drôme, and you will enjoy the use of the ground floor studio. The first floor is only used by the owner during school holidays. From your terrace or your sunbed you will have a panoramic view over the green valley and the splendid mountain tops at Lus-la-Croix-Haute (2,5 km). From the beautiful garden there are footpaths that will lead you throughout this stunning area. Would you like to stop and cool down for a moment on the way? Then why not take a dip in the Buëch River(3 km), with its ice cold mountain water. Those who are more adventurous will love the rope bridge trail in La Jarjatte (7 km) between ravines and trees. Here you can also take the ski lift to enjoy the stunning view. Then you can race back down hill from the mountain on special carts. There is excellent skiing here in the wintertime. Maybe you are looking for more relaxation and culture? The village of Serres (37 km) is a perfect place to go for a stroll. The medieval Châtillon-en-Diois, France (33 km) is definitely worth a visit, as is the Château de Montmaur (35 km). This castle offered shelter to members of the resistance during World War 2.